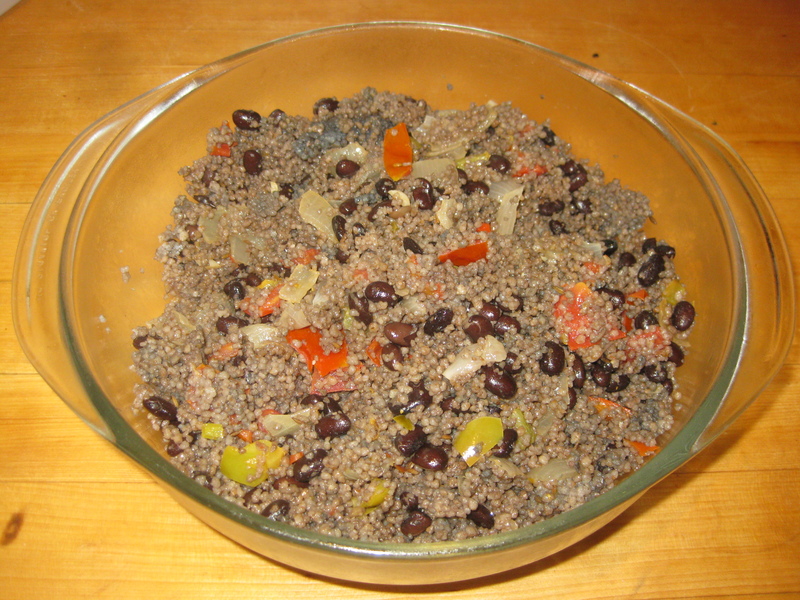 Black beans and couscous are delicious and nutritious when combined with spicy vegetables. The combination is good hot or cold, and can be served with salad fixings or alone. (Ingredients from section 1) Put the beans, spices, and water into a large pot, and bring to a boil. Lower heat, cover, and cook until the beans are softened, about 35 minutes. Check occasionally to make sure the beans keep their shape and aren’t too soft. (Ingredients from section 2) Add the couscous and salt, cover the pot, and cook 8 minutes. Check the water occasionally to make sure the couscous doesn’t start to stick to the bottom of the pot. Add water as necessary. When the couscous and beans have finished cooking, remove from heat and stir in the lecithin. (Ingredients from section 3) While the couscous and beans are cooking, heat the olive oil in a large skillet. Saute the chopped onion until softening. Add the chopped pepper, chili pepper, and garlic and continue sauteing for 5 minutes. Add the tomatoes and saute five minutes more. When the vegetables are soft, remove from heat. Add the sauteed vegetables to the couscous and beans and mix well. Taste and adjust seasonings as needed.